Since I cannot find a Chapter level year-to-date service hour report in LodgeMaster, this is how I managed to produce the numbers the Chapter Adviser wanted. First, go to the Event Manager. 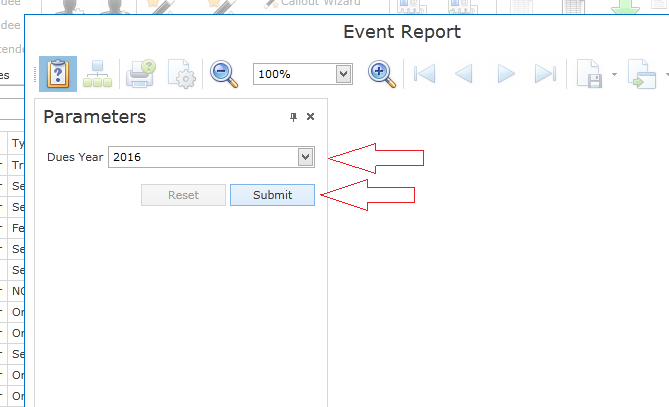 You don't need to pick an event; that is just where Service Hour reports are on the menus. 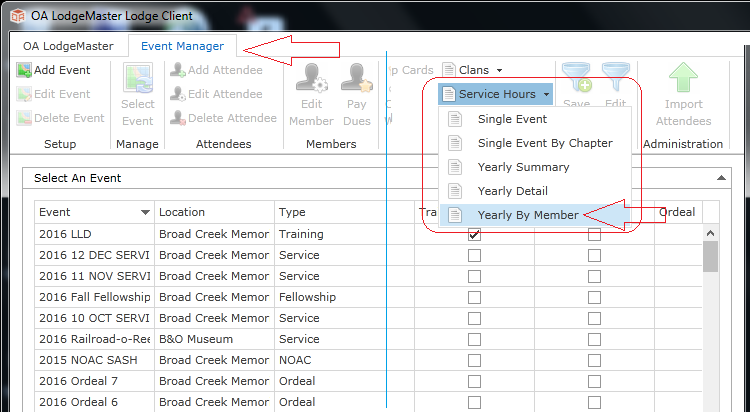 Click on "Yearly By Member". Yearly Detail returns similar data though more detail, requiring more work at the end for totals. Generally, pick the current year as shown. If you need to look at last year, change that field. Then Submit. After the report appears, click on the "Save" icon (the old school floppy disk icon). 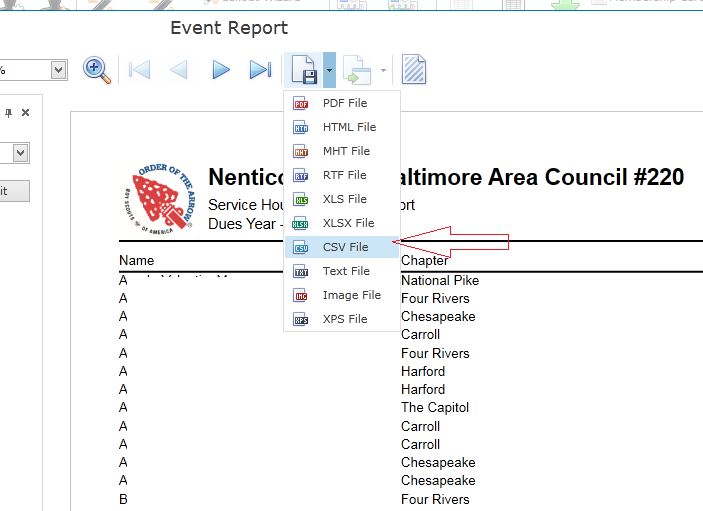 You can choose XLS, XLSX or CSV to create a file for a spreadsheet. 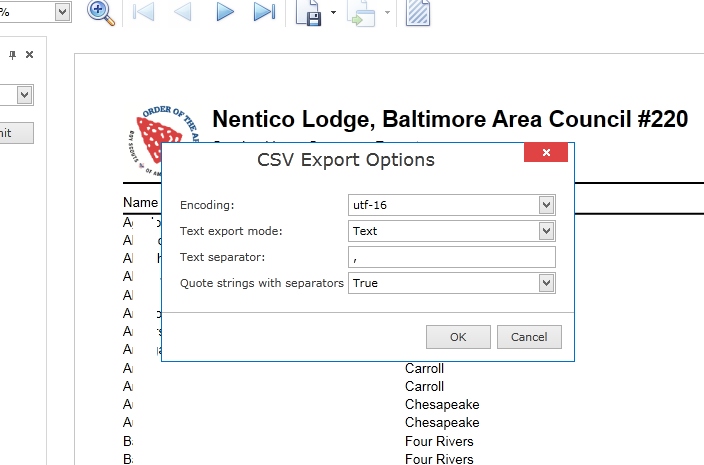 The next menu with CSV Export Options can be left with those that appear (click OK). I like to include a date in the Year-Month-Day style in the name of the file for easier identification later. Once you have the file on your hard drive (or cloud drive or wherever) you can load it into Excel or another spreadsheet programs. The red oval above shows the first four lines that include heading information. In an Excel format (XLS or XLSX) the first line has a graphic OA logo. 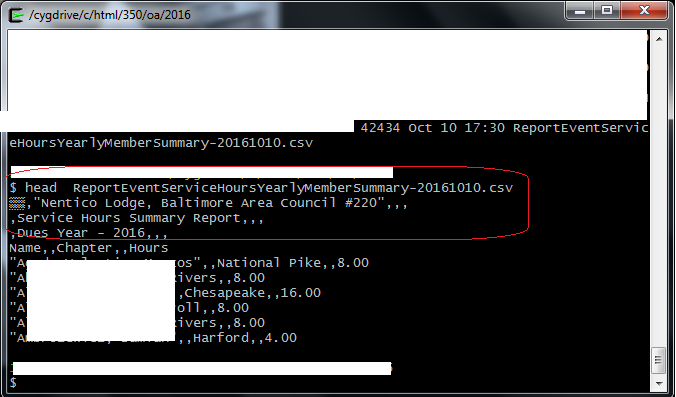 Either in the CSV file or in the spreasdheet program, remove these first few lines, leaving Name/Chapter/Hours at the top. After that, it's a matter of sorting by the Chapter column and either removing those outside your area, or just summing the hours for your Chapter.